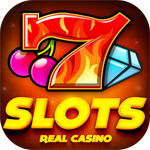 Real Casino Slots is a gaming environment that allows Fb players to simulate casino game play with slots and poker. Real Casino is played for virtual coins! Mobile for Android and iOS. Play on Facebook!